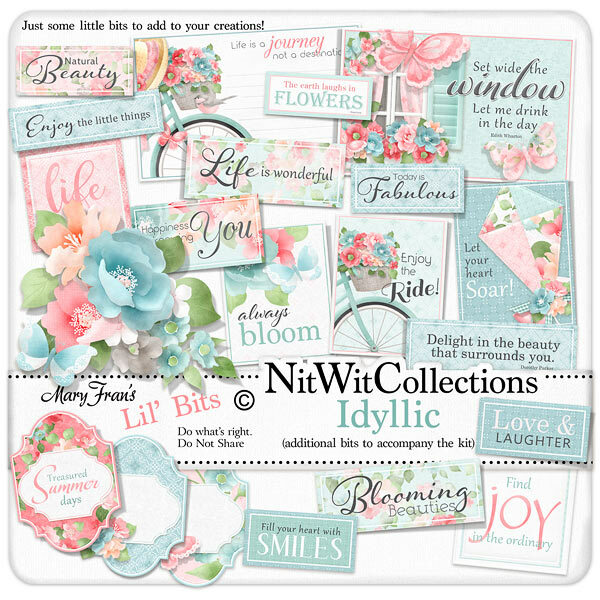 Lil' Bits "Idyllic" adds a whole new set of digital elements to create your mini albums, cards and scrapbook layouts with! These gracefully finished elements lend you a helping hand in having the clustering, scale and sentiments already included....you choose where to place them. Don't miss out on these digital elements as they are not included in the FQB "Idyllic" Collection so please don't miss out on owning and creating with these elements! 1 Floral teal journal card - "Always Bloom"
1 Journal card with the bicycle - "Enjoy the Ride"
1 Journal card with the kite - "Let your Heart Soar"
1 Lined journal card with one of the bicycles - "Life is a Journey...."
1 Journal card - "Find Joy in the Ordinary"
1 Journal card - "Life is a Pleasure"
1 Journal card with the window scene - "Set Wide the Window, and Let Me......"
10 Labels with phrases that harmonize with the feel and theme of this digital kit. Some are well adorned with floral beauty while others are more simple, to try to accomodate many visions and tastes. 1 Label tag - "Treasured Summer Days"